Al-Bayda Massacre, is a massacre that occurred on May 2013 in the village of Bayda (Arabic): البيضا, in Tartous govern orate Syria. This horrendous massacre of at least 70-100+ civilians, including women and children, many killed with blades and some burned, occurred in al-Bayda (here on Google maps) in the mountains 5-6 km south of coastal Baniyas. It was reportedly carried out by the Syrian military and "Shabiha," but as usual, that rebel explanation for another batch of bodies is contested by much evidence. It's closely related to and sometimes confused with the larger next-day Baniyas massacre in the nearby Ras al-Nabi' district of Baniyas city. The numbers of dead reported by different activists range wildly from around 50 to 400 or more, with the lower end of the scale being far more likely - at least 70, possibly as high as the 165 names listed by one activist group. Whether killed soldiers/Shabiha or rebel fighters are included in any of the tallies is unclear, but opposition reports make it sound like all victims are civilian. It seems a majority at least were, and included women and children and whole families. (seetalk page, death toll) Most seem to have been shot dead, but some were slaughtered with blades, and some bodies were burnt. See the discussion page for at least a bit more information on a number of sub-issues with this incident. Below are a select few points, summarized. Baniyas and its surroundings lie in the coastal Tartous province, the Alawite-dominated part of the country, but are both Sunni-dominated and, as usual for places that suffer massacres like this, surrounded by Alawite villages. 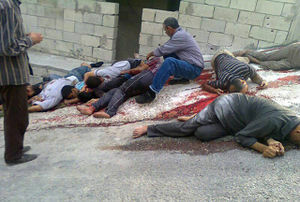 The massacre(s) occurring there are said, therefore, to be part of the supposed cleansing of Sunnis from the Alawite area of the country, a motive claimed previously for massacres in Homs and Hama province to the east (see Haswiyeh massacre, for example). Until May, Tartous has seen little if any such mass violence like that to the east, but it seems the pattern is migrating. 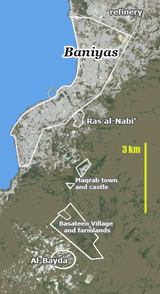 Above at right is a map showing the general area: Ras al-Nabi' is where the following day's massacre reportedly happened. At least Maqrab and Basateen in between had additional fighting and/or massacres reported in those few days, and so might be worth considering. Locations identified within the central part of al-Bayda area are compiled onto the handy map on the talk page and inset small at left. 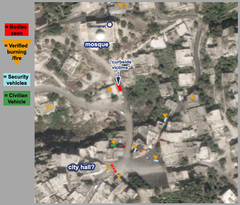 The two most famous out-door arrays of male victims have been pinned down ("curbside victims" refers to the scene in the top image here), relative to the square, the mosque, various building that were burned, and four security vehicles and a civilian car that were also burned. Interestingly, as in many other such cases, the massacre came after a battle between rebel and security forces. At an early hour once given as 4 AM  but perhaps earlier, rebels in al-Bayda ambushed a group of loyalist fighters (alternately given as soldiers or "Shabiha"), killing 7 and injuring some 20-40, and perhaps taking those prisoner. That victory belies the opposition claims that there were only 0-14 rebel fighters there (see here for more on that claim). It was this rebel victory, most agree, that brought the larger army presence of later in the day who "cleansed" al-Bayda of the militants or, alternately, rampaged around killing scores of innocents just for being Sunni. State media ran video footage of weapons seized in the raid; rocket-propelled grenades, rifles and ammunition - nothing extraordinary, but more than 14 fighters' worth. Activist "Ahmad" told Reuters, for a late-May report, how "the Biyasi family suffered some of the worst losses, with 36 documented deaths" among the sheikh's extended kin, "even though he always opposed the protests." Presumably, Ahmad would have us believe, the reason was the his religion alone. 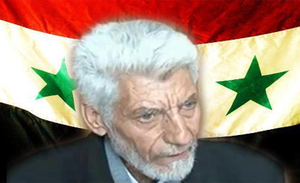 At least 40 members of other families - Fattouh, Hamouda, Qaddour, and al-Shoghri, each of which had an intermarriage with the Biassi family, were also killed on May 2. (see here and here). Due to new information, this section is down for renovation. It will be replaced when the renovations are complete. Until then, see the old version on the talk page and/or the discussion/renovation section there. This page was last edited on 20 July 2016, at 12:08.